The latest news about Micromax is that the company is testing Android 4.3 Jelly Bean OS on Micromax Canvas HD A116, Doodle 2 A240 and Canvas 4 A210. Although the company has not officially revealed any information / press release on the same. But this info is leaked by the MMXNewscaster. 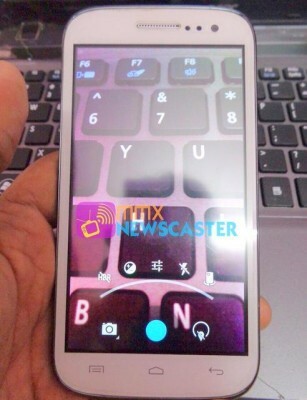 An image is also leaked showing new camera interface on Canvas HD A116. The Micromax Canvas 4 A210 comes with 13MP rear camera, 5 inch HD display,powered by 1.2GHZ Quad core processor paired with 1GB of RAM and runs on Android 4.2 Jelly bean operating system. The Canvas HD A116 is the compnay’s first quad core smartphone that packs with 8-megapixel primary camera, 1.2GHZ MT6589 quad core processor with 1GB of RAM and it runs on Android v4.1. The Canvas Doodle 2 A240 also has 1.2 Ghz quad-core CPU and 13MP primary camera. HOW TO UPDATE your DEVICE to Android 4.3 ? If the news is to believed users can soon update there devices. Go to Settings, About Phone and then System Updates. Check for the update notifications. It Will be really interesting if the news comes true. It is good way to make customers happy and make them believe in Micromax. Android 4.3 is the latest OS which is loaded in Nexus 7, Note 3 and many other devices. According to the source, Micromax is also planning to launch new Flagship device in November, which would have 4G supports. How to update Doodle 2?